This weekend I was in Raleigh, NC giving a reflection for Vocation’s Sunday and Franciscan Formation weekend as an attempt to raise interest in and support for the friars, the shepherds of so many. I ask that you take these petitions seriously, that you may follow Jesus more closely and in return, share with others what Jesus has given you. Without a shepherd, the sheep are lost. Sheep are interesting creatures. 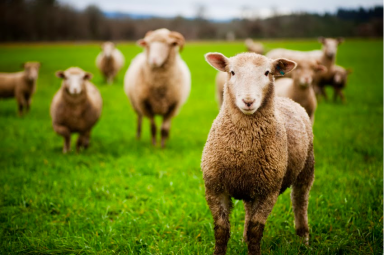 Born without horns, claws, strength, speed, or really any way of defending themselves, the only thing sheep have is each other: when frightened, they clump together as a giant flock protecting each other through a strength-in-numbers technique. Their instinct to look to one another for safety is the very thing that keeps them safe; unfortunately, and quite ironically, it’s also their greatest danger. Sheep are natural followers, having no instinct whatsoever to lead. When clumped together, any movement from the heard is interpreted as a sign of leadership and the rest blindly follow along. It’s no wonder, then, how sheep have been known as entire flocks to walk right off a cliff. In turkey a few years back, 1500 sheep ran right off a cliff, one after another. How could an animal be so stupid, we wonder. They act without thinking, are often lost or confused, and go with the crowd because they’re afraid to be different. You wouldn’t happen to know of any other animals like this, would you? I wonder… Have you ever intended to do one thing and ended up doing another; got distracted with what you were doing, went with the crowd, and ended up somewhere you never wanted to be; have you ever been tempted to do things that were not good for yourself or others, led astray by something or someone that didn’t care about you? We can be just like the sheep sometimes, can’t we, wandering through life looking for help in all the wrong places. We are a people in need of a Good Shepherd, someone to guide us and protect us. Luckily, we have one: his name is Jesus, and he has risen from the dead, alleluia! 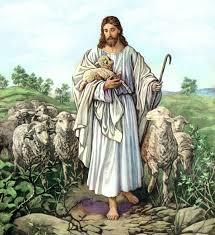 He is the Good Shepherd because he knows his sheep and cares for them. He loves his sheep so much that he gave up his place in heaven to come down and be a sheep himself. He has walked the life we walk, suffered the pain that we suffer. He took on everything about us but our sin. Jesus Did this because he loves us; because he loves you. He cares about you. He wants to know you. Jesus is the perfect Good shepherd because he is at the same time shepherd and sheep, God and human, because he was willing to lay down his life for the flock. His life, death, and resurrection remind us of the great love he has for us as his flock. We are in need of a Good Shepherd, and we have a Good Shepherd. If we follow Jesus, we will never be weak for he is our strength; we will never be lost for he is our guide; we will never be alone for he is our great love! With Jesus as our Shepherd, there is nothing we shall want. He guides us where we need to go and gives us everything we would ever want. We have no need to fear because we know he is with us by our side. If you think about it, our cups our truly overflowing with his many blessings. How can we even begin to count the many ways he has loved us? We are in need of a Good Shepherd and nothing more. We are in need of good shepherds, people to do Christ’s work. Some people, like myself, have been called to religious life, and one day to become a priest. God has called me to lay down my life for his sheep, to give up my own life for the sake of others. What does this mean? 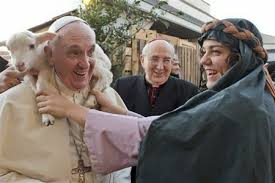 I think pope Francis has it exactly right: at the end of the day, a good shepherd smells like the sheep. This is what I want. This is what Franciscans do. We are called to live a radical life with the poor, for the poor, as the poor. When we enter, sure, we give up our money and possessions. But it’s much more than that: when we accept Jesus as all that we need, vowing to live a life for him and for others, we are truly without worry. What could there possibly be to worry about? Seriously. Advancement in our careers? People won’t like us? Wouldn’t have enough money to buy the latest clothes or get the coolest technology? In this life, all that I ever have to worry about is how I’m going to love God’s people for him. That’s it. It’s a remarkable life being a shepherd in this way. We are in need of a good shepherds to devote themselves entirely to the Church as priests, brothers and sisters. Others, no less important, are needed as shepherds in other ways. Where would we be without teachers that take care of our leaders of tomorrow; police officers that keep us safe and together; public servants that lead us to where we need to go as a society. As the laity, each of you is called to a special vocation, to be a shepherd in a way that we friars simply cannot be: you are called to evangelize people outside of the Church with your lives. Since you live and work in the world, you interact with people of all faiths and backgrounds, people that do not know or believe in Jesus, people that would otherwise never enter these walls to hear us preach, to be guided in faith or by the Church. Everything you do is a form of evangelization. This is a vocation truly your own. We are in need of good shepherds to live by example, evangelizing everyone they meet with love. And lastly, how can we forget the greatest group of shepherds we know: mothers. Mothers are the shepherds of the family, the ones that guide us from the time that we are very little and keep us safe. Without mothers, I’m fairly sure that by the age of five we would have all been like the sheep wandering straight off a mountain. If you want to talk about a person that lays down their life and smells like the ones they serve, there’s no better example than mothers. [I actually have the interesting, and frankly terrifying, opportunity today in that my mother is actually here. So, whether she wants the attention or not, I have to say that] My mother has meant the world to me. She has worked hard to give me everything I have and supported me in everything I have done, including becoming a friar. Before I had even considered it, one of our friars said to me: You’d make a great friar. I laughed at him. I thought it was a great joke and so I told my mom that night. Can you believe what father said to me today? Her response: you would make a good friar. If that’s what God is calling you to do, I would definitely support you in that. Trust me when I say that that was not the answer I wanted to hear… but it was the answer I needed to hear. My mother’s support helped me in my vocation. We are in need of good shepherds that will raise good families and encourage their children like my mother has. The first is easiest but most significant. Please pray for more good shepherds in our world. Make it a daily practice to pray for vocations to the friars, to communities of sisters, and to the diocese. Pray for good men and woman to take leadership in the church, society, and in their homes, to live lives worthy of following. And pray for the people who have already chosen to be shepherds that they may have strength and be guided by the Holy Spirit. If we are a people that believes in the power of prayer, I beg of you that you take this petition seriously. The second petition is that you support our way of life with a monetary donation. The friars have many men who dedicated their entire lives to the Church, giving up everything they had for the sake of others, and are now growing old and infirm, no longer able work. On the other side, we have 17 men like myself training to be the shepherds of tomorrow. So that we can be the shepherds that the world needs and deserves, we need your help paying for the six years of school and character formation each of us goes through. Lastly, I ask that you consider being a shepherd yourself. Maybe God is calling you to lay down your life for others, either in society or in building a family. These are incredible vocations we desperately need. On the other hand, we can’t ignore the face that there is a tremendous shortage of able men and women running the Church today. Which makes me wonder: is God calling fewer people today than he did before, or are fewer people willing to answer that call. Maybe, just maybe, God is calling you to live a radical life with the poor, for the poor, as the poor. Why not you?? Mothers, the shepherds of our families, why not your son or daughter? Have you ever encouraged your son or daughter to a life in the Church, to become a friar, sister, priest? Why not? I know that I would have never even considered it had it not been for the support of my mother, and trust me when I say, I couldn’t be happier. We are truly a people in need of a Good Shepherd and we have one. Jesus is there to be our strength, our guidance, and our love. All we need to do is follow him, and to share what he gives us with others. And so I ask you: how has Jesus called you to be a shepherd today? Br. Casey Cole, OFM, is in the post-novitiate stage of formation to friar life. He currently resides at Holy Name College in Silver Spring, Md. His reflection, dated May 11, 2014, is taken from his blog, Breaking in the Habit.